Powers: Flight. Thangarians have access to a large arsenal of alien weapons. From the trailers, it seems as if Hawkgirl will wield an energy mace. Comments: All right, I’ll admit that I know nothing about Hawkgirl/Hawkman. I remember them from my superpowers action figures, but by the time I got back into comics they had already entered continuity hell. The animated version of Hawgirl is supposed to be a warm and friendly character, but when the action starts she’ll break out into “berserker” mode ala Wolverine. 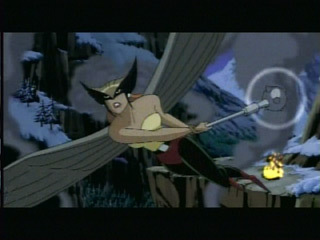 Hawkgirl was added to provide another female character on the team. Though it’s not a forced fit, since Hawkman and Hawkgirl have been long standing members of the League. I personally would have liked to see Black Canary, but I think that Hawkgirl fits better into the whole intergalactic action that the animated Justice League will have.